Learn from one of the best female bodybuilders in the world. Whether you are a novice or a seasoned competitor I love to coach athletes of all classes and experience levels. Step under my wing and receive next level support and coaching either online or face to face. All you need is some weight lifting experience in the gym (a little or a lot) as well as a goal to take your most aesthetic physique onstage and I can coach you all the way into your competition. Carefully tailored programming to the individual ensures the best muscle development and I have tried and tested all my systems not only on myself but on hundreds of my clients since 2003. 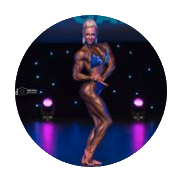 See Johanna’s bodybuilding coaching client gallery!